Punkin Center Gin is a family owned and operated cotton gin in Lamesa, Texas. Al was raised in south Texas and started working for Smith Gin COOP in Odem, Texas at the age of 14. He immediately fell in love with cotton and heard that West Texas was the place to be. 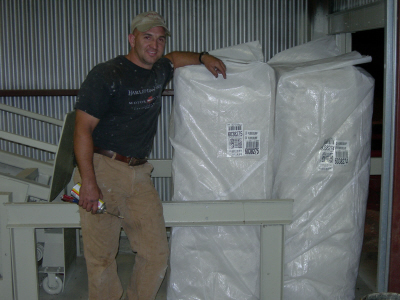 After graduating from Sam Houston State University in Huntsville, with an agricultural mechanization degree, he headed to Lubbock to work for the Texas Cotton Ginners Association. From there, he went to work for Odonnell COOP as their plant manager over their 3 gins, and in September of 1999 he purchased Punkin Center Gin. Kasha (Als wife) runs the office and keeps the books for the gin. (She is the real reason that people gin here) We raise and homeschool our kids in the gin office during the season. It is a busy life, but we wouldn't change it. We strive to treat everyone as if they are our only customer. We offer a custom job with a family touch. Please come by and give us a try.......we will make you feel at home.